Accepts Yad Vashem propaganda book as good enough to go by. According to a letter (see below) received by a German reader of this website from Sabine Stein of the Gedenkstatte Buchenwald (Wiemar, Germany), the Buchenwald Memorial’s acceptance that Elie Wiesel is one of the men in the famous Buchenwald Liberation photograph is based on the reliability of Yizhak Arad’s The Pictorial History of the Holocaust. This book was published several years after the New York Times announced to the world that Elie Wiesel was in the picture, and the U.S. Holocaust Museum went along with it. 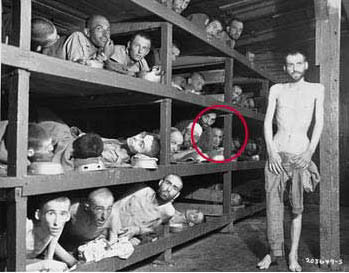 There has never been any real, or convincing, verification that the man in the picture is Elie Wiesel. Originally published in 1990, The Pictorial History of the Holocaust was edited by Yizhak Arad; designed by Hava Mordohovich, published by the Yad Vashem Holocaust Martyrs’ and Heroes’ Remembrance Authority in Jerusalem. It says on the copyright page: The publication of this album was made possible through the initiative and generosity of Miriam and Haim Schaechter. The Editorial Board is composed of Yizhak Arad, Reuven Dafni, Gideon Greif and Yehudit Levin. Maps drawn by Alissa Gold. The book is a 100% Jewish-Israeli production (note the Star of David on the cover) and is partisan propaganda. But the Buchenwald Memorial outside of Weimar has nothing better to point to as why we should believe that Elie Wiesel was one of their famous “guests.” This book captions the picture in question as: “Elie Wiesel, Nobel Peace Prize winner 1986, is the farthest right on the second tier from below.” Interesting that they add Nobel Peace Prize winner, isn’t it? That was the whole purpose of claiming Elie to be in the picture to begin with. Sabine also admits that Simon Toncman (standing, who never identified himself in the picture) was identified by his internee number, while all others who are supposedly known to be in the picture recognized, i.e. identified, themselves. That means Elie Wiesel is self-identified, as is Myklos Grüner. To put a better face on this, Ms. Stein tells the letter-writer about the questionnaire of 22 April 1945. But as we know, this questionnaire was filled out for Lázár Wiesel with a birthdate of Oct. 4, 1928, not Sept. 30 which is Elie’s birthdate, and the hand-written signature on the questionnaire doesn’t match Elie’s later known signature. The Buchenwald ID number given to this Lázár Wiesel is 123165, which had formerly belonged to a Pavel Kun who died on 8th March ’45 (one month earlier!) That means it could not have been given to Elie Wiesel when he arrived and was registered at the end of January ’45. Why would young Elie Wiesel be given, in April, a new ID number that had belonged to a recently deceased inmate? And at the same time be given a new birthdate? With all these problems, this questionnaire is still used, along with the photograph, to “prove” Wiesel was detained in Buchenwald. I conclude that the Memorial Museum is only going along with these weak pieces of “evidence” because it is itself part of the “holocaust” business. We must remember that the Buchenwald Memorial was the creation of ex-inmates, mostly communists, who had. and still have, a vested interest in promoting the worst possible view of the National Socialist Germans. No exaggeration or lie was too great for them to enshrine as truth. The organization these ex-inmates formed still runs the Buchenwald Memorial site today. Therefore, Sabine Stein says a complete list of the names of the liberated internees of the KZ Buchenwald, who were present at Buchenwald on April 16, 1945, is not available from her. In other words, she cannot clear up the mystery of Elie Wiesel, she can just go along with the narrative as it is and not make waves. The letter from Sabine Stein to our reader, with personal information removed, is translated below into English. Please find the enclosed answer of your questions as per our previous notice. Permit me some remarks concerning the general position of the memorial regarding its archive and documents. The Archive of the memorial does not posses the original registration of the KZ Buchenwald, nor the original documents of the closing of the camp after its liberation in April 1945. Those documents are stored at the International Search Service of the Red Cross at Bad Arolsen (www.its-arolsen.org). The basis of our research is a biographical collection of individual persons and comprehensive reports for our archive. We started in 1971; for historical reasons it is therefore forced to be incomplete. In order to arrive at dependable results, additional relevant collections and archives have to be gained, specifically in regard to internees who were transferred to different national socialist concentration or destruction camps. With exception of Simon Toncman who was identified by his internees number, all other named persons recognized themselves. Elie Wiesel’s identification was based on the publication of Yizhak Arad’s The Pictorial History of the Holocaust, Maxwell Macmillan International 1992. On page 403 is the photo and on page 404 the following text appears: Buchenwald, after the liberation, survivors in their barracks. Elie Wiesel, Nobel Peace Prize winner 1986, is the farthest right on the second tier from below. 2) Regarding the liberated person Elie Wiesel, there exists a questionnaire on microfilm for inmates of the concentration camp 22nd of April 1945, (BwA 51-11-842). The original is at the aforementioned ITS (International Tracing Service) Arolsen. When counting the dead internees based on the camp statistics, you made an error. According to documents of the camp office, official death is registered for the time span 1.1.1945 to 31.3 1945. (Jan. 1 to March 31—3 months -cy) During that time 13.910 internees died. Throughout years of research we tried our best to determine the names of all deceased internees of the KZ Buchenwald. Yet at the beginning of 1945 arrivals died before their personal datas could be registered, in that case the statistics of the camp register them as “unknown” death. All those not-named deaths are registered at the data bank as “unknown death,” by day of death and location of death. For the time of January till April 1945 a total of 1265. Because the archive of the international search institute at Bad Arolsen unfortunately remained closed for us, the files available there are not yet worked into our memorial book. This will be done in the near future. A complete list with the names of the liberated internees of the KZ Buchenwald or the persons present at Buchenwald on 16.4.1945 is unfortunately not available. Further information might be found at the National Archive at Washington. Of the 5 Buchenwald internees numbers, I can only name the one of Miklos Gruener (Michael Nikolas Gruener), 120762. The one of Wiesel, 123165, you know already. The other numbers I could not find because the number card is not handed down (or complete). Only ITS Arolsen can also help here. Yeah, isn’t this the guy who miraculously escaped from three, no 4 concentration camps and had his tattoo miraculously removed leaving no scar. Yeah I think it’s the same guy. The world poured its heart out to the alleged survivors of the prison camps of WWII only to be duped by many of them. There are still 125,000 of them in the US collecting sheckels. Nice work if you can get it. Wouldn’t surprise me to find out Israel wants to charge the Palestinians for killing them like the jewish influenced government of the US wants to charge the Iraqi’s for illegally invading their country for Israel. They’ve been kicked out of dozens of countries throughout history. There MUST be a reason. History is the best teacher. The torah and the talmud are weapons of mass destruction and their adherents are enenies of humanity. No, this isn’t the guy who escaped from 3 or 4 camps. He didn’t escape from any. Nor did he have his tattoo removed. You’re thinking of someone else. Josh, you’re right that he doesn’t have it. But he didn’t have it removed either. He never had it, so your word “still” is misleading.